I have been a fan of Jerry Bridges for several years. I was first introduced to Bridges when I picked up Transforming Grace—a warm and refreshing treatment of the grace of God and how we can practically apply the liberating truth of God’s grace to our daily lives. Then I read The Pursuit of Holiness, followed by Discipline of Grace and then The Gospel for Real Life. Needless to say, I quickly learned that Jerry Bridges is not only doctrinally in-tune with the truths of the gospel; he is relentlessly passionate about the gospel. When I heard that Bridges was teaming up with a close friend (Bevington) to write a thorough and accessible treatment of Christ’s atonement, I was excited to devour the truths I knew would be clearly and practically expounded in their work. I was not disappointed. Bridges and Bevington also focus on the representative life of Christ, explaining that the fullness of Christ’s atonement not only happened at the cross; it was occurring over the course of his whole life, while Christ was walking in perfect obedience to God’s law on our behalf. Christ was our substitute, not only in his death, but also during his life—he lived a perfectly righteous life in our place and died the death we deserved. As a result, God can now justify those who trust in Christ because he credits Christ’s righteousness to them, while transferring all their guilt to Christ; a guilt that has been fully paid for at the cross. God remains just and we receive pardon from sin and perfect righteousness. 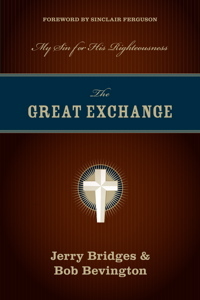 Bridges and Bevington also emphasize the truth that the work of Christ’s atonement is not a work that happens on the inside of us (although it is the grounds for God’s work on our hearts), it is an external, finished, objective, historical work that has already fulfilled the law of God in our place. There is no work left to do; that is why faith is the instrument by which we receive the benefits of this great atonement. In the latter two-thirds of the book, Bridges and Bevington take the reader through every major passage in the New Testament that speaks of Christ’s work of representation and atonement, mining each text for precious truth. Major passages from the book of Acts, all of Paul’s epistles (excluding Philemon), Hebrews, I Peter, I John and Revelation are examined and proclaimed. The final product is a Scripture saturated exposition of Christ’s work for our salvation (there are over 1000 Scripture references in the book, and only five references from other sources). Well-written and throughly grounded in Scripture, this book is one that deserves to be read and reread. I know how easy it is to be tempted to think that we, at some point in the Christian life, get beyond the gospel. When I oblige this temptation, I am usually led into paths of self-righteousness and spiritual frustration. On the other hand, when my mind is enraptured by the fullness of Christ’s work on my behalf, I find what Christ calls, “rest for [our] souls” (Matthew 11:29) and power for obedience. For these and other blessings, I recommend this book to you. hmm..could you tell me where that book sell? i am in indonesia now. I linked the book. Just click on the link above. It will take you to WTS books. If that does not work, try Amazon.com. thanks for this posting. i appreciate a comprehensive review of the book. i haven’t picked up any jerry bridges’ book yet, but now i really want to pick some of his books and learn from his wisdom and insight. also appreciate your sharing about shane and shane’s song. i love their worshipful mindedness when it comes to their songs and concerts. it’s such awesome to hear about God’s Great Exchange on our behalf for this truth is the only hope we have.